Do you mind if I start by saying that I don't know? I don't have the answers to my own questions. I don't understand how God is perfectly sovereign over the lives and safety of my six child-gifts—how He watches over each one of their numbered hairs and gives them each breath they take—and yet I bear a great responsibility in doing what I can to keep them safe. Is it the parents' fault? Would it have been my fault? I might have asked myself those questions, too, and come up with a quick, confident response, gleaned from nearly sixteen years of blog-reading, book-studying, Bible-believing kid-raising. I might have had an easy answer, except that six weeks ago before the drowning of the precious twins, before the death of the little boy at Disney, before the trial of the texting mom . . .
My sweet two-year-old, with the mischievous sparkle in his chocolate syrup eyes, with the face that gets swallowed up by his enormous smile, fell into a pool and nearly drowned. And so I wade through these news stories not as a blogger with answers, but as a mother with questions. Some people think to figure out what to write, but like many writers, I write to figure out what I think. This post will not likely be a cure for my (or your) questions, but rather exploratory surgery with, perhaps, a few findings. But first, here's what happened with Russell on the beautiful, breezy day we nearly lost our boy. My husband is the administrator of our local Christian school, so that Saturday, the day before graduation, we found ourselves attending three open houses—quite literally morning, noon, and night! We had made it through number one, at a park by the river, and number two, in a yard with a pond, without incident. But the end of the day was drawing near, and we were two hot, tired parents with six hot, tired children. Frankly, we were a little burnt out when it came to monitoring who had eaten what and who was going where with whom, and so at this last party, my husband and I found ourselves thankful for seats at a table in the front yard of the large home of the graduate's grandparents. Our older kids were scattered around the property with friends, and Russell was running about with boundless energy as toddlers do. We knew there was a pool around the back side of the house, so we were careful to keep him in our sight line. Mostly. Of course there were a few times when he escaped us, so my husband went around the corner, reprimanded him, and brought him back to where we sat. We were careful, but not vigilant. We knew there were a lot of other adults from our church back there with their kids, and a few times, perhaps, we let him linger longer than we should have . . . But we weren't worried, until our six-year-old daughter came bounding through the house and out the front door yelling, "Mom! Dad! Russell fell into the pool, and you need to come right away!" Michael immediately followed Lily to the pool area. I sat still, as if stuck to my metal folding chair by force of the questions whirling about my mind. This couldn't be a real emergency, could it? When seconds later, I made it back to the pool, I was met by Michael, carrying our fully-clothed, soaking wet, frightened little guy. His glassy eyes reflected the fear in mine as I heard how he had been on the pool deck with his big sister, who was talking to her friend in the pool. Reaching out toward the water in pursuit of a toy, Russell leaned a little too far and tumbled into the water, to the shock of Lily and her little friend. Somehow, Lily had grabbed him by the thumb as his hand passed by, but after a couple seconds was unable to keep his head out of the water. The pool, which a few minutes before had been swarming with parents and kids, was now populated by just a few children and one parent, who heard the girls begin to yell when Russell went under. This dad, (our hero! ), still recovering from shoulder surgery, ran over, reached in with his one good arm, and swept Russell out of the pool in just a couple of seconds. Russell was safe, and we left the party quickly so as not to make a scene (oh yeah, and we had a very wet kid). We breathed a sigh of relief and thanked the Lord for His goodness, and then we kind of let it go for the rest of the evening. Until it was nighttime, and I lie in bed wondering, What if? Slowly, I sank into the dark waters of questions, guilt, and doubt. Russell's fear was over; mine had just begun. From that day to this, not one has not gone by where I haven't thanked the Lord for the life of my little boy. But although my husband encourages me not to go there, my mind wanders down the path of "What if?" What if Hero-Jake hadn't been back by the pool? What if Lily hadn't grabbed Russell's hand? What if instead of hearing the cries of my cranky toddler right now, I was hearing the wail of my own sadness, staring down at the still, smileless face of my boy, his soul at rest in the arms of the Father? Would I be to blame? In the weeks since the other child-tragedies, there has been a lot of shaming of parents followed by the shaming of the shamers. So what's the biblical perspective here? When a child dies in a "preventable" accident, how much blame falls on the shoulders of fallible parents and how much on the sovereign Lord, who has power over all things and could prevent any tragedy with a single word? My short answer? My wading-through-the-news-as-mom answer? I don't know. But in the course of working through my questions in the last few weeks, I've come to a few conclusions to help me as I move forward. Perhaps they will be of benefit to you as well. 1. We (parents, adults, caregivers) must watch over our children carefully and diligently. Whether we're entrusted with one child or six or ten, the Lord has given us a little flock and placed them in our care. With Him as our model Shepherd, it is right for us to gather, carry, protect, seek, sacrifice for, and gently lead them (Isa. 40:11, John 10:11, Ezek. 34:12, Luke 5:4). 2. But we must do so with the understanding that our children are His and His alone. When I look at my son and think, I have been so careless! Why is he alive when those other children perished?, I can answer only this: It is not because of any good in me that God spared my child, but that for His glory and for His purposes, "He has mercy on whomever he wills" (Rom. 9:18). 3. We cannot be everywhere, all the time. My husband and I have six children. To think that we can physically protect each one of them all of the time is completely ludicrous. Even if you only have one child, it's ridiculous, although you sure can wear yourself out trying! The truth is, we are only parents, not omnipresent. But God and God alone "watches over all who love him" (Ps. 145:20 NIV) all of the time ( Ps. 121:3). When tragedy occurs, we must weep with those who weep, refrain from determining parental "fault," and take heart in knowing that God works all things together for good (Rom. 8:28). 4. But we can do better. Distracted parenting. I am guilty of it. How about you? For some of us, it's not necessarily how much time we spend on our iPhone but how much time we spend on "I." I just want to have some down time. I just need a break. I just want to send one text. I just want to be able to have a conversation at this graduation party without having to be constantly interrupted to look for my child. It's not that those things are bad, but our tendency is to get a little lax instead of doing the work to be attentive parents. For our large family, that means "taking shifts" of little-kid watching when we're at large events, including our older children. It's okay for us all to sacrifice some freedom to patiently protect the weak among us (1 Thess. 5:14). 5. We must remember that every choice we make creates a ripple effect that touches many lives. When we chose to let down our guard that day, we didn't consider the effect that our choice would have on others. For example, the owner of the home at which our incident occurred came up to me at church the next day. She was teary and sleepless, having been up all night beside herself after learning on Facebook (my mistake) that our little boy almost drowned in her pool. I can only imagine her sorrow had the situation turned out worse than it did. Our choices are not our own. We must regard one another as more important than ourselves (Phil. 2:3). 6. We must beware of the greater, hidden dangers. The physical dangers of raising children are real, but more important even are the greater, hidden, spiritual dangers—the alligator in the Seven Seas Lagoon, to use a Disney analogy. Entering the gates of "the happiest place on earth," we willingly suspend our sense of reality. We ride the rides and believe in magic, completely oblivious to the dangers that lie beneath the glitter of pleasure. Too often as parents, we are so distracted by the wonder of showing our children what the world has to offer that we fail to adequately keep watch over their souls (Heb. 13:17). The fact that you don't understand how they go together only proves that you're less than you should be. It doesn't say anything about God. Your inability to harmonize those things is a reflection of your fallenness, my fallenness. People ask me all the time, "How do you harmonize those?" And my answer is, "I don't. I can't." They can't be harmonized in the human mind. But realize this, you are a puny mind and so am I, and collectively we are puny compared to the infinite, vast, limitless mind of God. All I can tell you is that in the Word of God, these truths run parallel. And the answer is to believe them both with all your heart. And the one, divine sovereignty, will inform your worship and the other, human responsibility, will motivate your evangelism. Parents, caregivers, it seems that there is truth here for us as well. It's difficult to navigate the blurred edges of where our responsibility ends and where God's sovereignty begins because that is, in a sense, a false dichotomy. For we know this: He is perfectly Sovereign, and we are certainly responsible. May the very fact that we are confounded by these truths motivate us to worship Him wholly as we do the hard, hard work of doing what we can to keep our children safe. 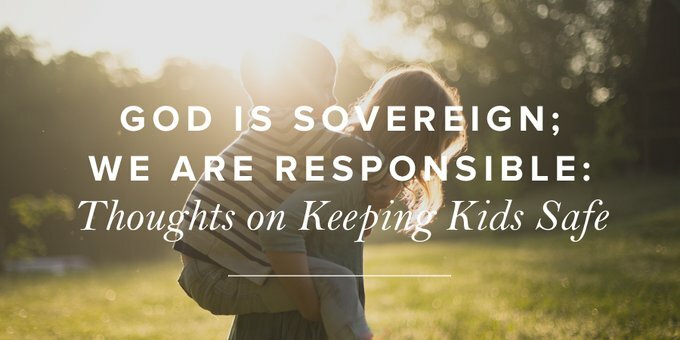 Parents, how have you worked to reconcile your responsibility to care for your children with trusting in God as He rules and reigns over all things? Where might you need to remove distractions in order to focus on the physical and spiritual needs of those in your care? And in what areas do you need to relinquish control and place your children firmly in the Father's care? Natives of Michigan’s beautiful Upper Peninsula, Laura Elliott and her husband, Michael endeavor to serve the Lord with gladness in Minnesota as they raise five sons and one daughter, while ministering at Chisago Lakes Baptist Church and School, where Michael serves as the school’s administrator. Laura’s passions include words, music, and encouraging women to pursue the God of Scripture in every season of life. In her so-called free time, you might find Laura cooking (or watching Food Network) at home in North Branch.